From husband-and-wife team Tom Angleberger, creator of the New York Times bestselling Origami Yoda series, and Cece Bell, author/illustrator of the Newbery Honor graphic novel El Deafo, comes the start to a funny and clever illustrated chapter-book series about a mystery-solving Venus flytrap. With easy-to-read language and illustrations on almost every page, this early-chapter-book series is a must for beginning readers. 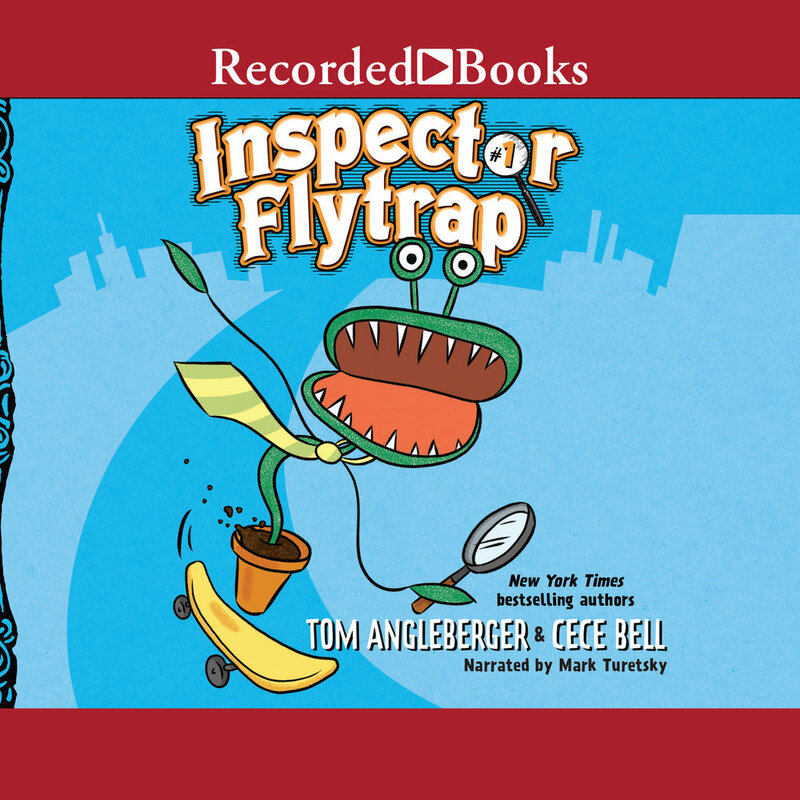 Inspector Flytrap in the Da Vinci Cold introduces kids to the humorous and wacky world of Inspector Flytrap’s Detective Agency, home to the world-renowned solver of BIG DEAL mysteries. The plant detective works tirelessly with his assistant Nina the Goat on his community’s unsolved cases. There’s no case too big, but there are definitely cases too small for this endearingly self-important plant detective. On his first caper, Inspector Flytrap heads to the Art Museum’s Secret Lab to discover what important message lies in a mysterious glob on a recently discovered Da Vinci flower painting. The ingenious solution: Da Vinci was allergic to flowers, and the glob is, er, evidence of that ancient sneeze. Combining wacky humor and a silly cast of characters with adventure, friendship, and mystery, the powerhouse team of Tom Angleberger and Cece Bell have created a uniquely engaging series that is perfect for newly independent readers and fans of Ricky Ricotta, Captain Underpants, and the Galaxy Zack series. Also included in these books are some graphic novel–style pages that will attract reluctant readers. Inspector Flytrap and Nina the Goat return in a set of mysteries involving the president of the United States and a very large horse statue that mysteriously attracts a threat from outer space. Welcome to Inspector Flytrap's Detective Agency, home to the world-renowned solver of Big Deal mysteries. Inspector Flytrap, a Venus flytrap, works tirelessly with his assistant Nina the Goat, a goat, on his community's unsolved cases. There's no case too big, but there are definitely cases too small for this endearingly self-important plant detective. From husband-and-wife team Tom Angleberger, creator of the New York Times best-selling Origami Yoda series, and Cece Bell, author/illustrator of the Newbery Honor graphic novel El Deafo, comes the third title in a funny and clever chapter-book series about a mystery-solving Venus flytrap. With easy-to-understand language, this early-chapter-book series is a must-have for beginning listeners. In this new caper, what happens when Flytrap loses his partner in crime solving? All the clues point to his assistant, Nina the Goat, as the culprit, leading the city to arrest her and leaving Flytrap goatless. To save the city, Flytrap must unveil the true master criminal. But, can he do it alone? Inspector Flytrap in the Goat Who Chewed Too Much brings listeners back to the wacky world of Inspector Flytrap's Detective Agency, home to the world-renowned solver of BIG DEAL mysteries. The plant detective works tirelessly with his assistant, Nina, on his community's unsolved cases. There's no case too big, but there are definitely cases too small for this endearingly self-important plant detective. Celebrating the disabled yet enabled, the character Inspector Flytrap is wheeled everywhere (on a skateboard, of course) by his goat sidekick as this mystery-solving duo works on cases such as "The Big Deal Mystery of the Stinky Cookies" and "The Big Deal Mystery of the Missing Rose". Combining wacky humor and a silly cast of characters with adventure, friendship, and mystery, the powerhouse team of Tom Angleberger and Cece Bell have created a uniquely engaging series that is perfect for newly independent listeners and fans of Ricky Ricotta, Captain Underpants, and the Galaxy Zack series.